Kerri girl I LOVE IT!!! Your halloween card is rockin girl!!! LOVE how you did this sketch and that image, paper and stitching...love it!! You love that fleur de lis punch! I do too - - but I'm having trouble using it and making it look good; grrr. I love purple with Halloween - - not sure if you cut geometric back there or if that's the paper pattern - but it's really neat behind the witch panel. What an aodrable card! Great job on this sketch, Kerri! Love the stitching! I love the black stitching, and the orange button. 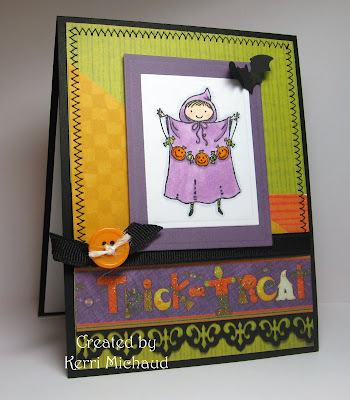 This is a super cute Halloween card!